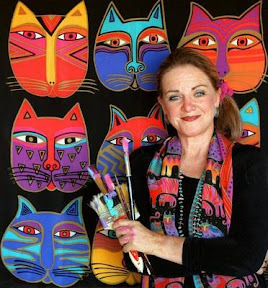 Famed artist Laurel Burch passed away last Thursday, at the age of 60.....after an almost lifelong battle with osteoporosis, a disease which so crippled her, that her bones broke with almost any impact. Laurel is best known for her vibrantly colored images of fanciful cats, horses, birds, blossoms and ocean creatures. She once said that being diagnosed with osteoporosis at the age of seven caused her to create an inner world of her own...a world where everything was "beautiful, safe, colorful and happy." There she invented the world that became her "bridges to people", where could pass on the joy..... of all that she saw inside. She began her career at age 20, in the streets of San Francisco. She was a single mother, recently divorced and trying to support a small child. Her colorful necklaces and earrings made of beads sold well, and soon she was creating out of her own garage. Eventually her home business found a production market in China and was transformed into her now famous metal cloisanne jewelry. Laurel later branched out into her scarves, coffee mugs, sweat shirts, posters, and as most of us know.....fabrics. Even when extremely ill, she continued to create for her company and monitor its progress from her bed. I recently visited her website at LaurelBurch.com Home and was moved to leave a condolence message for her family on site. I couldn't help but think that this once free-spirited artist, was truly now totally and forever free. Free to truly soar...from the streets, to her garage, to her business office, to her bed...and now finally over some vibrant rainbow bridge to where all dreams spring eternal. You don't have to be a life-long Laurel Burch fan or even to especially like her vivid art, to simply be touched by the heart and soul of this lovely woman. So, in her honor I downloaded a delightful computer screensavers available at her site...at no charge. There are three different sets...all pictured here. Each set has multiple screensavers in each volume...each following the basic theme, shown. That site is at LaurelBurch.com Screen Savers and comes with one of the best interactive calendars that I've seen. Maybe now that I have an easy to find calendar that I can add my events to, I'll be more apt to notice that September ends today, October begin tomorrow and Laurel Burch, who would have been 61 on the last day of this year...is now ageless. Certainly made me want to make the most of each beautiful and creatively possible new day! You have the best free offers of anybody on the web. I am a big Laurel Burch fan and this meant a lot to me to find these links. These are wonderful, free screensavers.